In the morning we will depart to Kakheti region. At first we will see David Gareji monastery complex - cut in a rock, which is founded by St.David Garejian - one of 13 St. Asurian fathers. 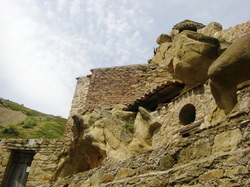 Then in Bodbe we will see St. Nino mother's monastery (4-12th centuries). Here we will see the grave of St. Nino and other religious things that are kept in the monastery. Near the monastery is miracle water source, which is sprang up by praying of St. Nino. Pilgrims have possibility to wash into this water. By washing into this water a lot of sick people can recover. In the morning we will see a monastery, founded by Stefan Khirseli - one of 13 St. Asurian fathers, which located in Signagi region, - in Tibaani village. He is buried here. then will visit Nekresi monastery complex, where we can see 4th century basilica style church and 6th century main church, which is basilica style as well. The main church is built by St. Abibos Nekresian - one of 13 St. Asurian fathers; he is buried here. Depart to Gremi, where we will see 16th century archangel cross-domelike style church. Then we will see Alaverdi cathedral church named of St. George, which located in Akhmeta region, on Alazani field. Alaverdi monastery is founded by Ioseb Alaverdian - one of 13 St. Asurian fathers, who is buried in this church. In the church we can see11th century frescoes. We will depart to Martkhopi direction, where we will see a faters's monastery - Gvtaeba, founded by Anton Martkhopian, - one of 13 St. Asurian fathers; after that we will see the pillar, where St. Anton Martkhopian spent 15 years with praying and fasting. St. Anton Martkhopian is buried in the main church. In the morning we will see Ulumbo church named of Virgin, which is founded by Miqael Ulumboian - one of 13 St. Asurian fathers. He is buried here.We will see a monastery, founded by Tadeoz Stephantsmindian - one of 13 St. Asurian fathers, then we will see a cave, where Tadeoz Stephantsmindian spent his life with praying and fasting .We will see Samtavisi monastery named of Our Savior , which is founded by Isidore Samtavnian - one of 13 St. Asurian fathers. He is buried here. then we will drive to Breti monastery, which is founded by Piros Bretian - one of 13 St. Asurian fathers. He is buried here. Dinner at the end of the day. drive and overnight in Tbilisi. In the morning we will depart to old capital of Georgia - Mtskheta, which is considered second Jerusalem. At first we will see Jvari Monastery, then we will see Svetitskhoveli Cathedral church (6-11th centuries), where are buried Christ's mantle and the pelerine of St. foreteller Elya. The church bears the name of Christ’s 12 mediators . Then we will see Shio Mgvime Monastery, which is founded by St. Shio – one of 13 St. Asurian fathers. We will see the cave, where St. Shio spent 15 years with praying and fasting. He is buried in this cave. In the morning we will see the monastery complex, which is founded by St. Ioane Zedaznian - the leader of 13 St. Asurian fathers. Near the monastery is miracle water source, which is sprang up by praying of St. Ioane. Pilgrims have possibility to wash into this water. By washing into this water a lot of sick people can recover. At last we will see Tsilkani monastery named of Virgin, founded by Ise Tsilknian - one of 13 St. Asurian fatheres.